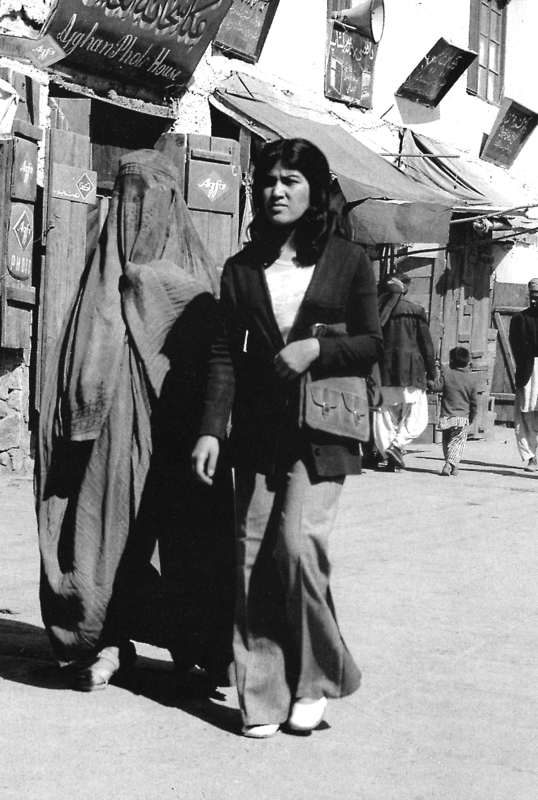 Throughout the 1960s and 1970s, Afghanistan increasingly came under the sway of external in­fluences. In towns and cities, people listened to pop music and watched romantic Indian movies. An increasing number of women studied at university and dressed in West­ern clothes. Students at the universities and the military academy read Marxist literature in Persian translation, while the Soviet, Chinese and American embassies all distributed propaganda literature. The massive presence of foreign teachers and advisers in higher education, ministries and development projects intensified external influence on the political climate in Afghanistan. After dethroning the king and taking over the presidency in 1973, Daoud went to work trying to curtail the influence of tribal and re­ligious leaders. This, however, did not seem to make him any more popular with the communists, who were disappointed with the slowness of land reforms. Eventually, in the so-called April Revolu­tion in 1978, Daoud was killed and the communists seized power. For centuries, Afghan agriculture and husbandry has been organised according to complicated tra­ditional rules regulating relationships between contract farmers, day labourers and land and estate owners. However, immediately after taking power in 1978, the communists introduced a number of agrarian re­forms which were implemented in a haphazard and disorganised manner. They upset the complicated social structures in the countryside, and the communists were furthermore extremely brutal toward the common people, whom they considered inferior and ignorant. Consequently, local groups soon began to rebel against the government. In December 1979, the Communist government was under serious pressure from internal strife and rural unrest. The Soviet Union was concerned about the prospects of an Islamic regime along the borders of the Muslim republics of Soviet Central Asia, and so Soviet troops were sent to Afghanistan as “brotherly assistance” to save the Communist regime in Kabul. With this, Moscow hoped that the Soviet Union could protect its ‘soft belly’ against yet another Islamic government in a neighbouring country. However, the Soviet invasion of Afghanistan in 1979 was strongly resisted and resulted in a decade of war and incredible suffering for the population. In a short time, the Soviet forces and the national Afghan army gained control over the larger Afghan towns and cities, while the scattered revolts in the rest of the country gradually developed into widespread resistance. In the early 1980s, the resistance was organised around 75 Islamic political parties in Iran and Pakistan. The Sunni Muslim resistance had the backing of Pakistan, while the Shia Muslims mainly organised their resistance from Iran. In both Pakistan and Iran, the authorities systematically supported specific Islamic parties, so the resistance was eventually dominated by seven Sunni Muslim and three Shia Muslim parties. The Islamic parties saw the resistance as a holy war – Jihad. The resistance fighters were, therefore, holy warriors – mujahideen. The resistance developed into a cruel civil war, and a growing number of Af­ghans joined the Islamic parties and their militant branches. The communist-led Afghan government army and the Soviet forces dominated the towns, while the resistance groups controlled villages and mountains. Via Pakistan, the resistance received US and Saudi Arabian support, and by the late 1980s, they had managed to cause the Soviet Union such massive human and economic losses that the great power withdrew its forces in 1989. The war cost around one million Afghan lives, while another three to five million Afghans fled to neighbouring countries. 14,000 Soviet soldiers also lost their lives. Beside direct human losses, the war left behind millions of land mines, extensive destruction of the subterranean irrigation systems and an impossible political situ­ation which would develop into another regular civil war.